A feline perspective in photos and anecdotes of animal friends around the world. Sometimes humorous, sometimes sobering, this blog is dedicated to all pets and wildlife. Personal 300 gallon Saltwater Reef Aquarium with a lot of helpful tips and ideas. 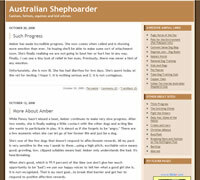 A blog with news about my ferrets: Chin Soon, Ella, and Zephyr. There will also be reminiscense about Tenchi, Adric, Ker Avon, Ryo-Ohki, Nyssa, Lady Ayeka, Romana, Pertwee, Podo, and Kodo, all of whom are gone now. Pet Planet talks everything about pets plus several informative articles about pets and pet product reviews. We are pleased to offer you the very best in nutritional products for your pet supplies. My passions have always been pets. Enjoy great stories, tips, FAQs, and more. Online Obedience Training. Quality Premium Food is important to me. Daily reefkeeping blog and bi-weekly podcast. A place where people can express their love for their animals (dead and alive).